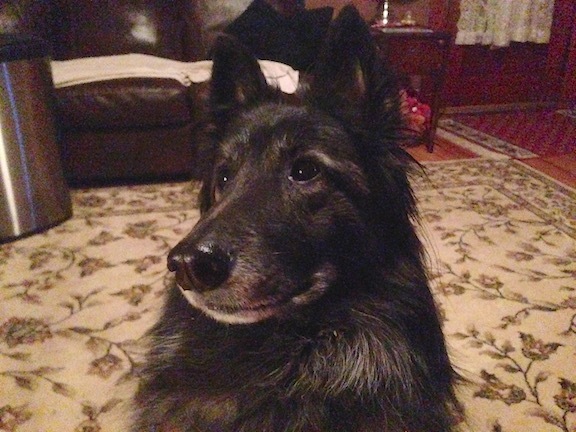 This is Luna, a three year old female Belgian Tervuren. Her owner contacted me for help with multiple issues; doesn’t listen to the family’s two teenagers, jumps up and / scratches windows when she can see dogs or people passing by outside, is food aggressive, counter surfs, demand barks and digs holes. All of these issues started with her family suffered the loss of the father last year. Luna’s owner confided in me how devastating the loss was and how its impact effected the family including Luna. When I arrived for the session, I could instantly tell that Luna needed some guidance and structure. She showed the least amount of respect for people’s personal space out of any dog I have worked with. She nudged, almost shoved her owners with her snout any time she wanted attention and to make matter worse, the family complied with her orders. Its likely that the loss of the family’s patriarch left a hole in the social structure of the home which Luna interpreted as an open spot she should fill. I started out by going over some basic non verbal communication methods that they can use to disagree with any unwanted behavior. One of the most pressing situations to use these new communication methods is when Luna fails to respect their personal space. While there is nothing wrong with contact between human and dog, it should be done in an appropriate manner. Luna shoving herself into the personal space of her owners is anything but. The first step is to disagree with the action or behavior in a consistent manner so the dog understands you object. I use a hissing sound like a cat and suggested that Luna’s owners do the same the next time she invaded her space. This sound got Luna’s attention, but didn’t stop her from leaning on her owner. I suggested that her owner observe the dog and when it is clear the dog is coming over to invade her personal space to make the hissing sound when the dog is still a few feet away. Its always easier to disagree or stop an unwanted activity before the dog engages in it. Because Luna’s owner’s timing was slow on the hiss, I had her take the next step, standing up. To a dog, standing up translates to “I mean business.” It important that you keep your hips and shoulders squared towards the dog and pivot your hips to rotate your check to keep the dog in front of you if it moves to the side. As soon as Luna’s owner stood up, the dog took a step back and looked up to see what her owner wanted next. Because she was now giving an appropriate amount of space, I had her owner sit back down. But as soon as she did, the dog went right back to invading her personal space. This would have been a perfect opportunity to use the hissing sound, but the window to do so requires precise timing and Luna’s owner’s hiss was too late. I had her take the next step which is to stand up, turn to face the dog and then march right at it with a “I’m not stopping” energy. I had her march right at Luna and told her to not stop until the dog sits or turns away. Luna’s owner started out ok, but as soon as she got close to the dog she started to lift up her leg and pseudo-push the dog back, Dogs often perceive pushing as playing so its certainly something you want to avoid. Now if the dog doesn’t move out of the way, you will end up bumping into it. That is fine. Just don’t add a shove when that happens. Once Luna’s owner started to use a sudden movement without any shoving, the dog started to respond quicker and with less effort. There is another final step I like to apply when the above steps fail and that is to place the dog on a leash and stand on it about two feet from the dog’s head. This is my equivalent of a doggy time out. When you place a dog in this time out, no one can play, speak to or interact with the dog until it settles down. Because Luna was reactive to people passing by the front window to the house, I suggested her owners apply this technique on days and times when its common for people to pass in front of the house. In Luna’s case, as soon as she saw people outside, she started to run around and get over excited. Its pretty common for a dog to loose control and focus when it gets too excited so helping it calm down and stay calm when exposed to a stimulus is an important thing to practice. By restricting Luna’s ability to move around the room or jump up against the window, we can help her learn to watch rather than react when she sees something outside of the window. It will take time and a lot of practice. But the more exposure the dog has to the sight of passers by without being able to react gives the dog practice at this new non reactive behavior. I also recommended that her owners stop petting the dog when it demands attention by nudging the humans with her snout. Instead I suggested that they give the dog a counter command of “sit” or “lay down.” These are more subordinate positions to the dog. By only petting the dog when it changes its state into one to the other, we can help Luna understand she is not he one who gives the order in this home. Luna is not a bad dog, she was just trig to fill what she perceived as a void of leadership due to the tragic passing of the father (a true American Hero who gave his life to help save another’s). In order for her to go back to being a follower, she needs to think that her owners have fulfilled that position. Little things like asking the dog to respect their personal space, petting the dog for following a command rather than demanding attention, feeding Luna after she watches the humans eat and practicing the various exercises I showed the family will all help redefine the leader follower dynamic in the home. Once Luna sees that the leadership position is filled and her help is no longer needed in that regard, she will revert to simply being a dog again.